Following the mammoth success of his epic tale Greendale, Neil Young alluded to the notion that he might retire from writing new material. 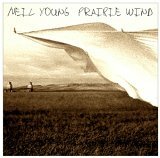 However, confronted by his father’s death, which came after a long battle with Alzheimer’s disease, and faced with his own mortality after being diagnosed with a potentially fatal brain aneurysm, he found within himself the inspiration to craft his latest masterpiece Prairie Wind. Musically, the collection straddles the line that separates the country-folk of Harvest from the subdued, blues-inflected stomp of Tonight’s the Night, though Young employs several notable twists to embellish and color his compositions. On No Wonder, for example, a heavenly gospel choir tugs against a guitar’s snarling hellfire; horns punctuate Far from Home’s jaunty remembrance of a distant childhood; and a string section catches the tears that stream from Only a Dream. Prairie Wind is available from Barnes & Noble.